A Maryland Circuit Court Judge had dismissed a class action suit against the Town of Riverdale Park which alleged that city officials and their contractor, Optotraffic, had forged the signatures of a police officer on thousands of speed camera citations which the officer never reviewed. The court ruled that citizens have no right to file a class action suit against a speed camera program for any reason whatsoever, without taking into consideration the issue of whether forgery or fraud had taken place. The case was filed last year by several ticket recipients after Riverdale Park Police officer Corporal Alford 'blew the whistle' on activities within the town's program, revealing that civilian employees of the town logged into the citation approval system under Alford's and approved citations, causing the signatures to be digitally imprinted with Corporal Alford's signature. police officers can approve citations. Optotraffic nevertheless imprinted thousands of these citations with the signature of a police officer under a statement saying that he had reviewed the citations, even during a period of time when the officer was away on leave and did not look at any of the tickets. Alford's attorney stated he revealed the information because he was concerned about being called to court and forced to lie under oath. Riverdale Park officials have not denied the core allegation: that civilians approved thousands of citations which were imprinted with the digital signature of an officer who never approved or reviewed them. The town's initial response was to temporarily suspend Corporal Alford, although he was later reinstated. Riverdale Park officials has so far made no move to refund any citations nor have they given any explanation for the events in question. Town officials refused to provide comment to reporters investigating the incidents at the time the case was filed. Alford himself was not a plaintiff in the lawsuit. In their request for summary judgement, defendants Riverdale Park and Optotraffic presented no evidence or information disputing the assertion that civilians approved the tickets imprinted with Alford's name. Instead, Prince George's County Circuit Court judge John P. Davey ruled that a previous court decision, Baker vs Montgomery County, means that speed camera ticket recipients cannot sue for recovery of damages FOR ANY REASON after fines have been paid -- even if the reason is based on an offense which might be a criminal violation of the law if it were committed by you or I. The basis for the ruling was that the ONLY remedy for a speed camera ticket who does not wish to "admit guilt" allowed by state law is for the recipient to contest the ticket in district court individually. This is despite the fact that it would be both economically and logistically impossible for thousands of ticket recipients to individually contest every ticket over the same systematic violation of the law by the government. The judge rejected the argument that ticket recipients had no way of being aware that the signatures had been forged until long after the required timeline for contesting tickets had passed and had no reason at the time to suspect the signatures were fake... even if the reason for this might have been because Riverdale Park did not make this fact known to the public. The court ruled that because the law authorizing speed cameras does not explicitly permit citizens to file a class action suit, plaintiffs have no standing to file a class action suit for any reason what so ever. 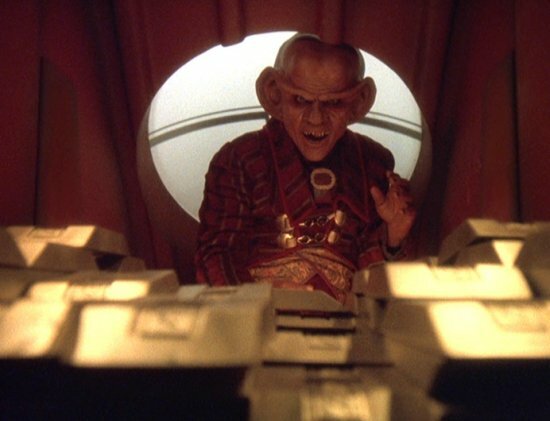 The new court decision makes it clear that the justice system in the state of Maryland has exercised their power to interpret "legislative intent", and have concluded that when it comes to speed cameras the legislature's intent was the Star Trek "Ferengi Rule of Acquisition #1"
Rule of Acquisition #1 "Once you have their money, You never give it back"
Judge Davey then went further than the Baker vs Montgomery decision, by ruling that plaintiffs also cannot file a lawsuit by asserting standing as taxpayers, because they could not demonstrate that their taxes increased as a result. In addition, the court ruled that Optotraffic's assertion that citation images cannot be used as evidence of speed could also not be a basis for a suit. This is despite the fact that by denying defendants access to secondary evidence of speed there would be no way to distinguish erroneous citations from real violations. As such a defendant who was genuinely innocent due to an erroneous speed reading would most likely have no way of proving their innocence in court and contesting their individual citation in a district court, which Judge Davey has stated is their only recourse. Some motorists did contact Riverdale Park around the time when the alleged forgery took place asserting that the speed readings had been incorrect. One of these motorists provided copies of their correspondence to the editor of our website showing that he had credible reason to dispute the speed reading. However that defendant was not a party to the lawsuit and had stated to us at the time that they had simply paid the citation because they ran a business and were concerned about reprisals by the town. Documents released by the town of Cheverly proved that Optotraffic speed cameras of the same type used in Riverdale Park are in fact capable of "false triggers" resulting in incorrect speed readings. The ruling makes clear that in the state of Maryland there are two standards of justice. There is one standard for motorists where the government hangs cameras on every street corner waiting for them to make a mistake so they can be fined under a system with no due process and a substantially reduced burden of proof, and another system for the government and their contractors where they can commit criminal violations of the law with impunity and keep the resulting revenue.